I’ll be the first to admit that the idea of eggnog grosses me out. However, I know a few eggnog enthusiasts (Dylan included) that would feel left out if we didn’t attempt this holiday flavor. 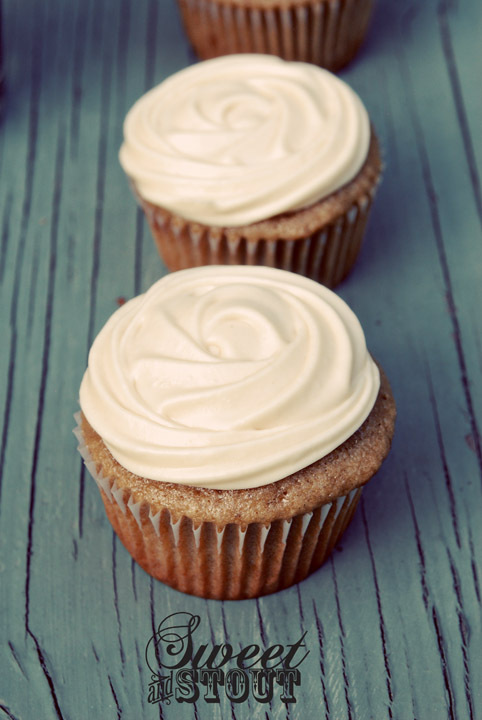 I will also admit here that I really liked these cupcakes (but I’m not about to pour myself a glass of eggnog). 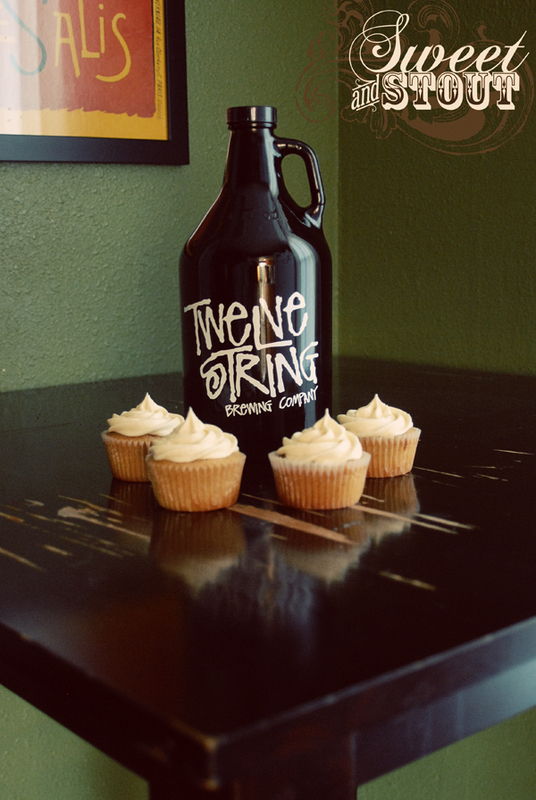 Our shiny new Twelve String growler! Friday night Dylan and I went out to check out the newest brewery here in Spokane, Twelve String Brewing Co. Intent on sampling all their offerings, we braved the cold, and found our way there. The tap room was warm and inviting, the atmosphere filled with chatter and laughter, it was a great evening! 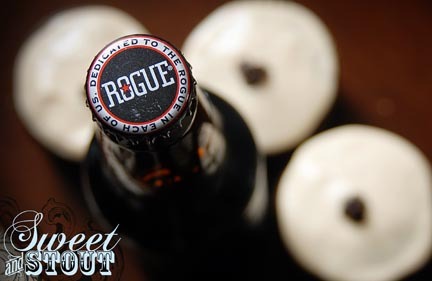 We sampled 5 brews, including their Don’t Fret Porter. This was probably our favorite beer of the night. 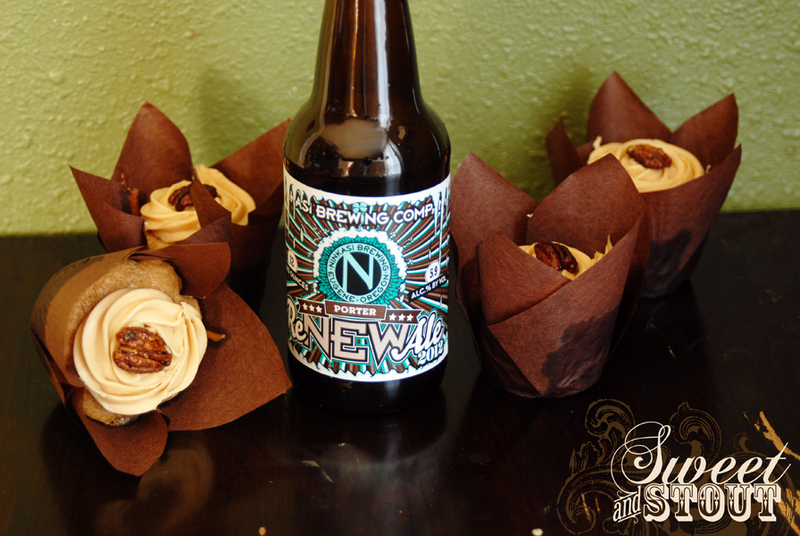 We bought a growler of it to take home because we knew that we had to bake with it. Now, I realize eggnog and beer don’t necessarily sound good together, but it turned out to be a great match. 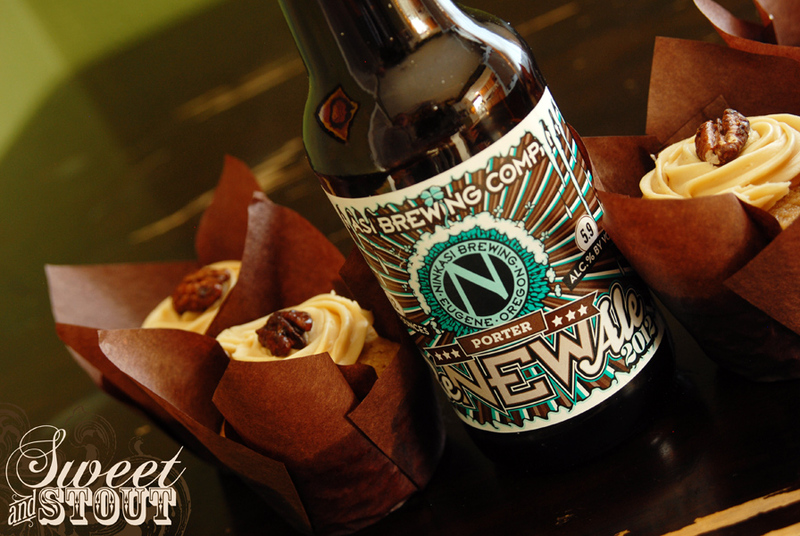 The nutmeg and spice in the eggnog cake paired well with the chocolate and coffee tones that flavor this porter. The smell of the kitchen was pretty enticing while these were baking (Amazingly, the oven decided to cooperate this time!). 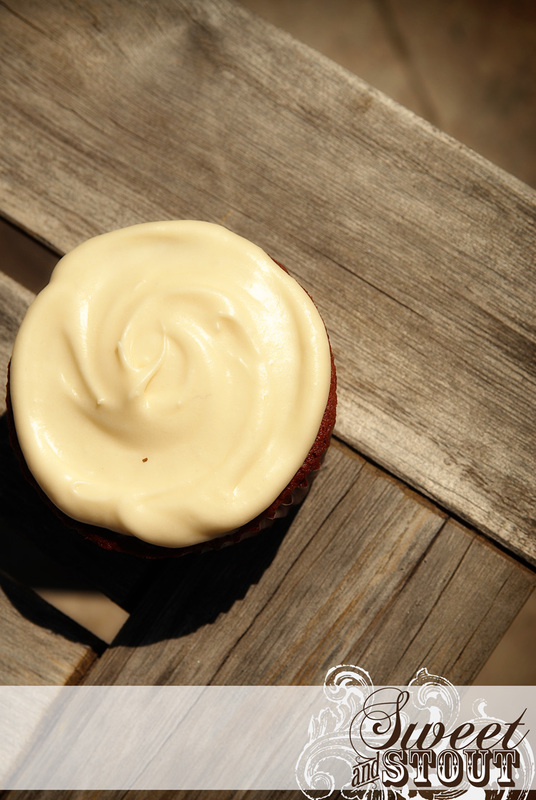 For the frosting, we went with a buttercream and used more of the eggnog and nutmeg to flavor it. Dylan frosted them all fancy-like, we’ve been trying to improve our frosting technique, and they look so pretty! If you live in the Spokane area, I highly recommend you stop over by Twelve String and sample their beers, you’ll be glad you did. Also, to my fellow Spokanites (is that what we’re called? 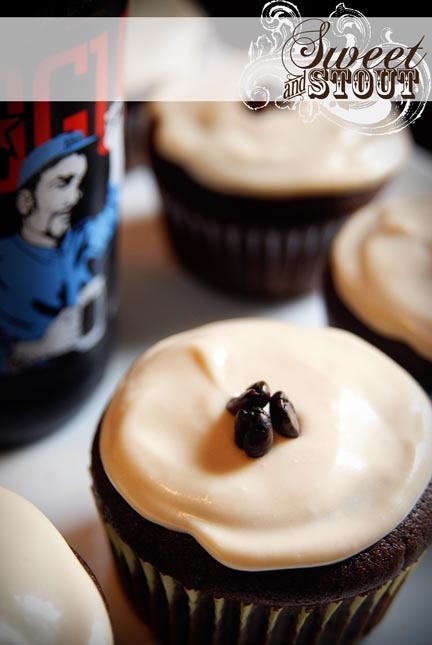 ), if you’re looking to get some Sweet and Stout cupcakes before Christmas, get a hold of us soon. 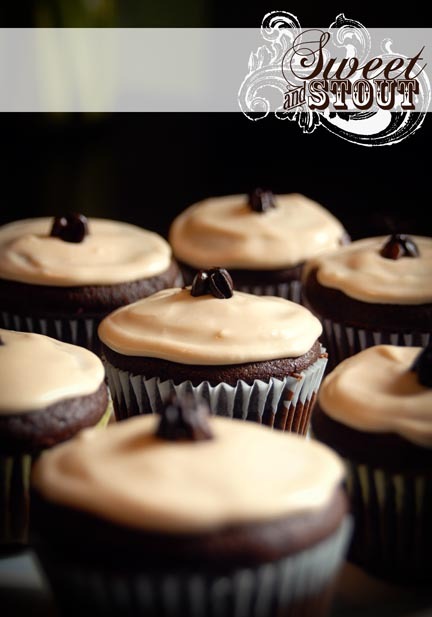 Only 2 more bake nights before then! Bacon and beer lovers unite! 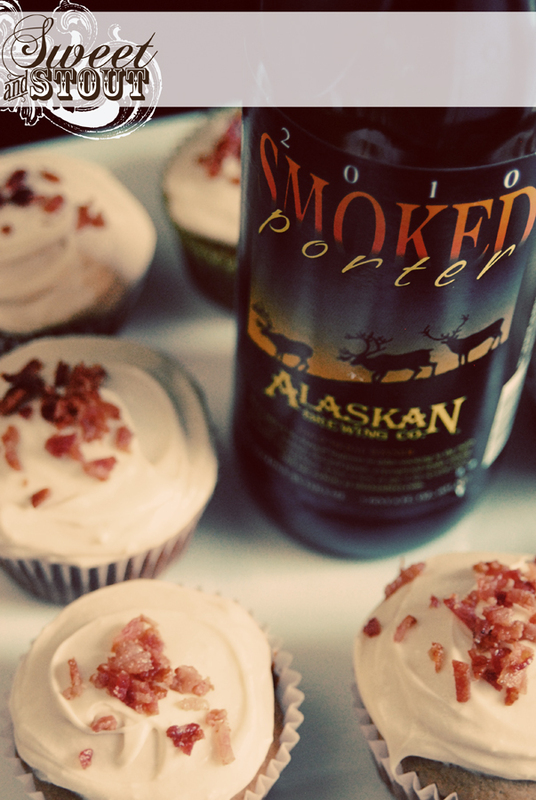 We decided to take our spin on the ever popular bacon craze and have paired up Alaskan Smoked Porter with the flavor of maple bacon. If you’re into smoked porters, this one is excellent. 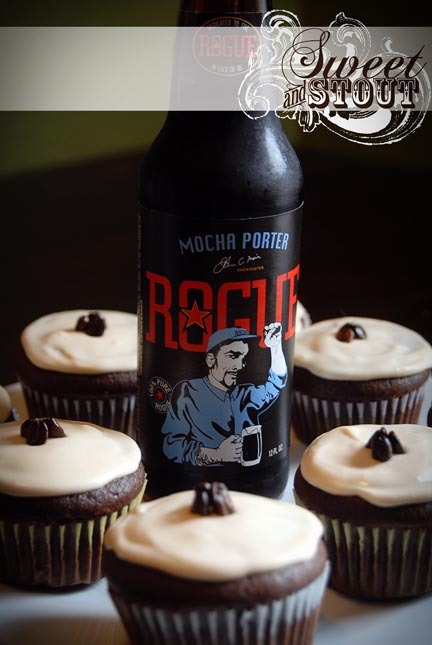 This beer would be great to drink right along side of these cupcakes. The smokiness is strong, not overwhelming, and is a nice compliment to the bacon. 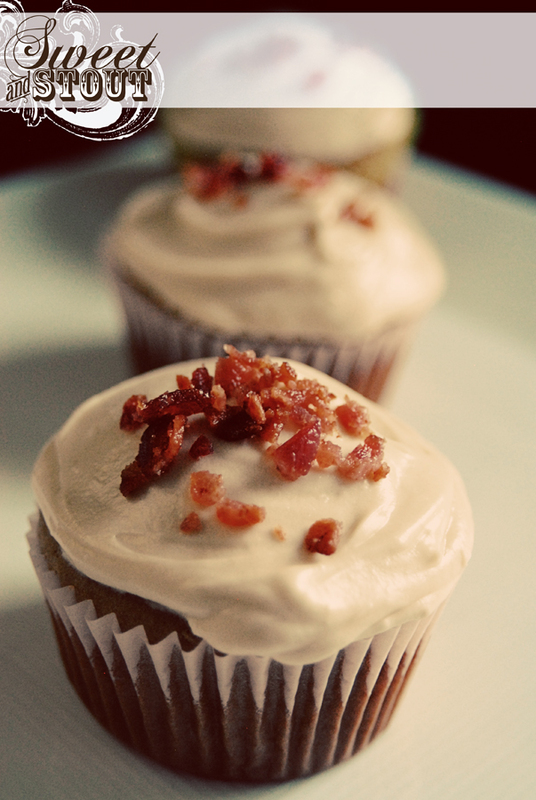 The funny thing about this recipe is that there is bacon dripping put right in the batter. 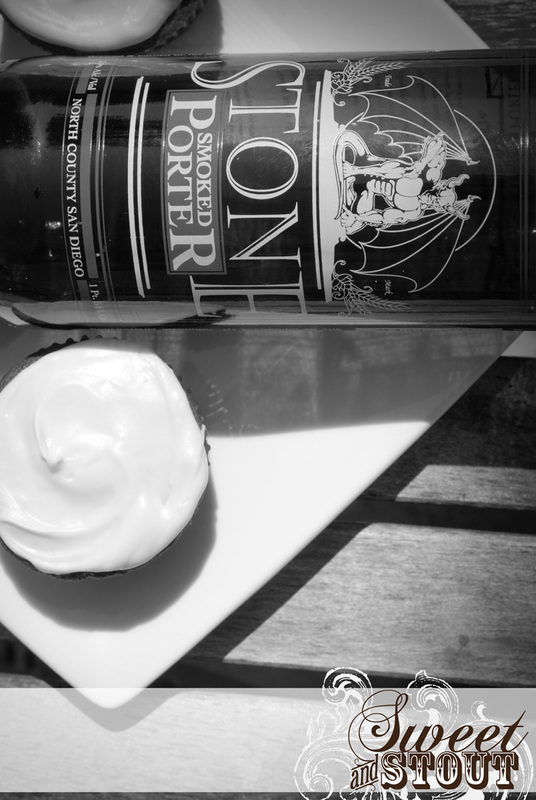 I found the recipe on Vanilla Garlic and made a few modifications to incorporate the beer and increase the amount of cupcakes it made. 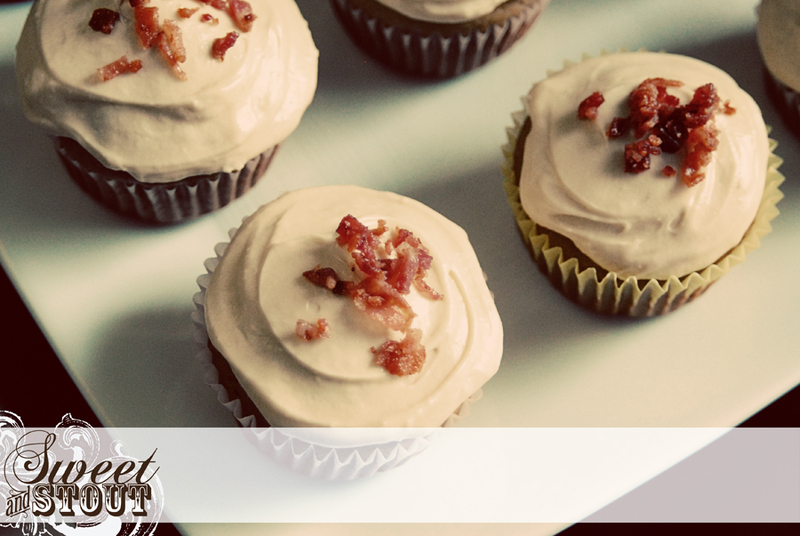 If you’re looking to try your hand at plain bacon cupcakes, that would be a good recipe to start with. 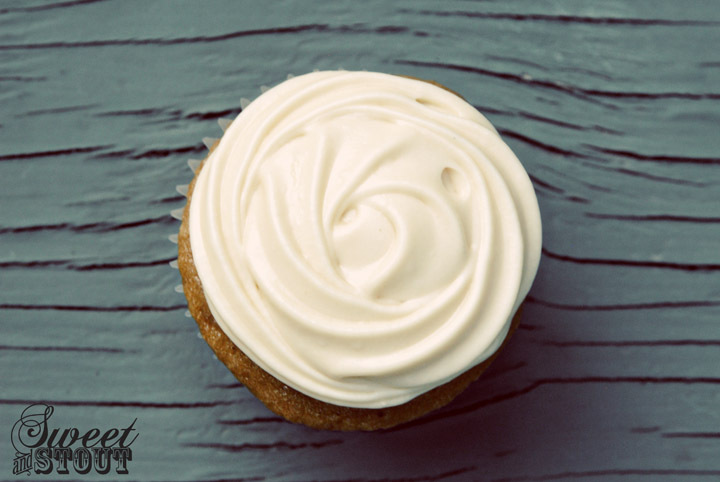 I went with a maple flavored cream cheese frosting instead of the one in the original recipe. I added a bit of maple extract and some good ol’ Mrs. Butterworth to the frosting to get that breakfast-maple-fresh flavor. 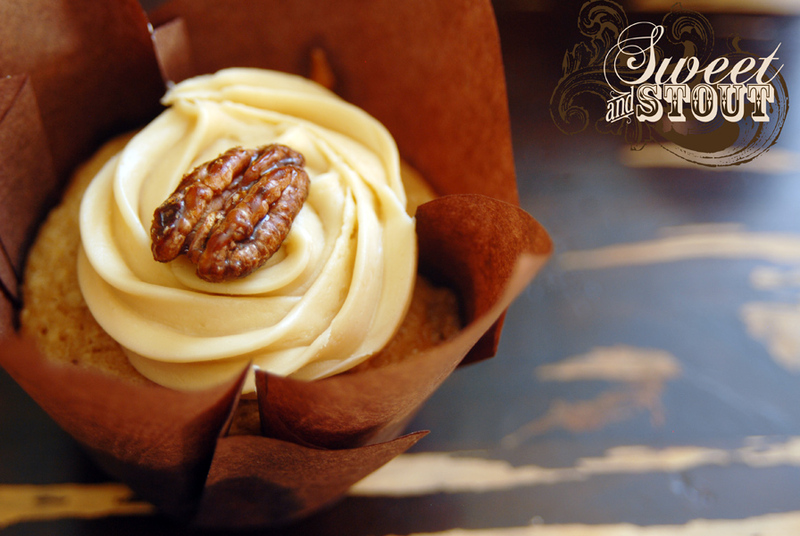 When you bite into these cupcakes it’s like all of the great things you love about breakfast, all rolled into one, and you don’t even need a fork! 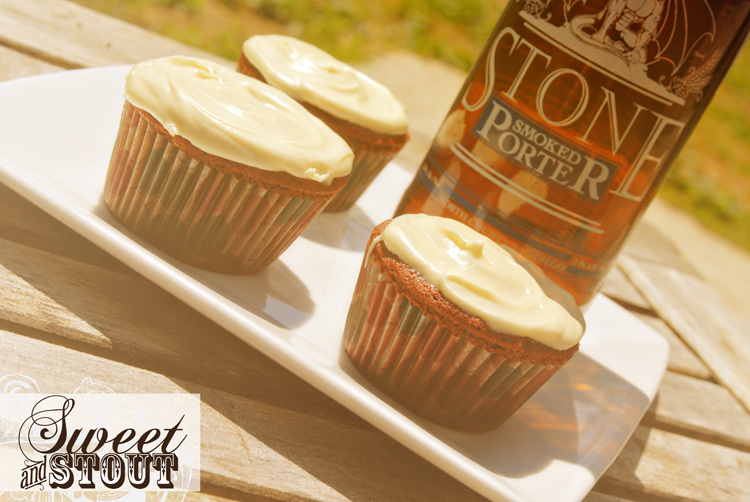 We’ll be adding this recipe into our list of keepers. I’m pretty sure I’d like to have this one at the wedding too, I know some of my friends back in my hometown would love to try them. They’re the ones that got me so into bacon to begin with! 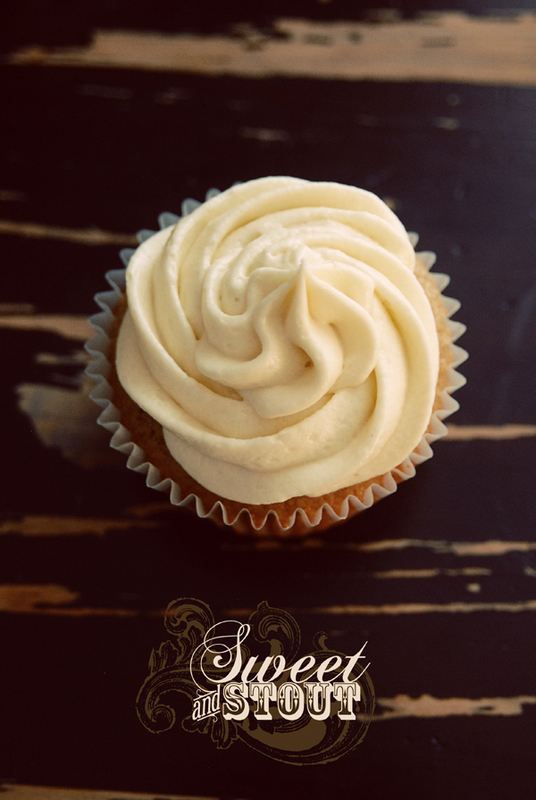 I will always remember these cupcakes, not only because they were amazingly addictive and delicious, but also because my boyfriend asked me to marry him just after I finished baking them! 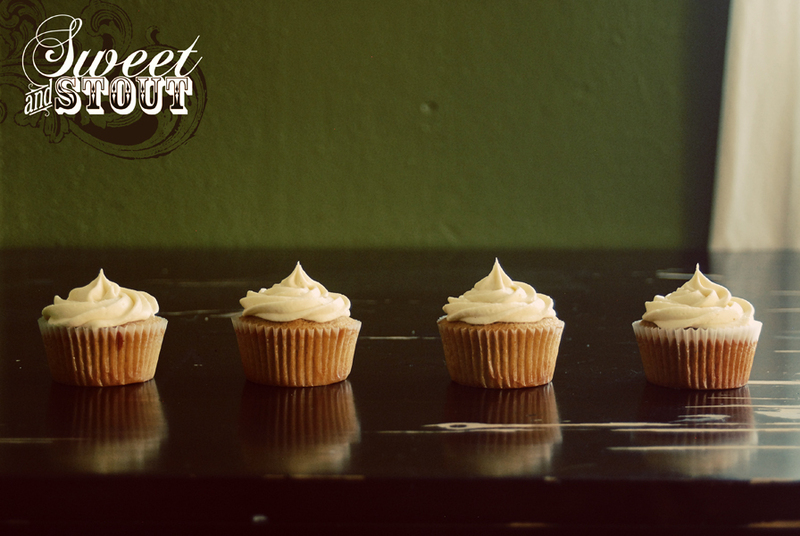 I promise this post will be about the cupcakes, but I just had to share. 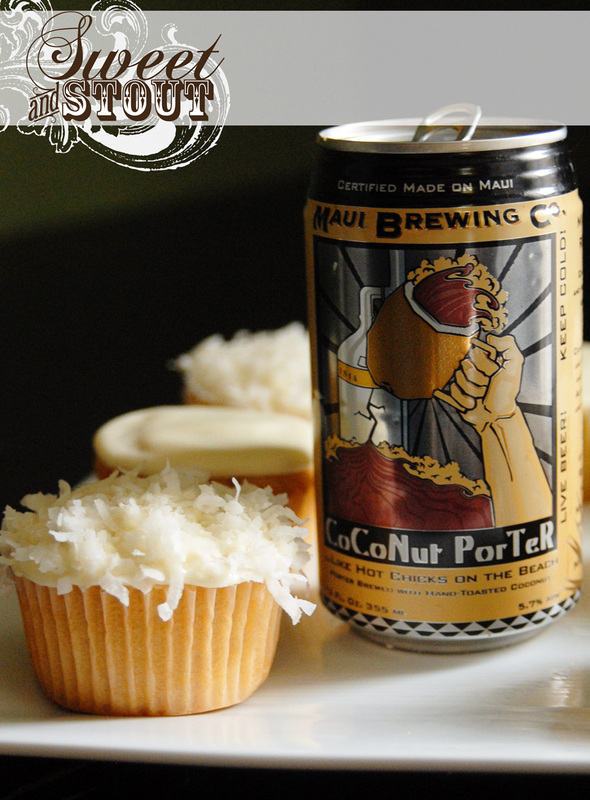 If you didn’t already know, coconut beers aren’t exactly easy to come by. A couple weeks ago Dylan and I discovered this amazing beer store in Spokane called JB’s bottleworks. From the outside it just looks like your average convenience store, but inside there were aisles & coolers full of many beers that I haven’t found anywhere else. 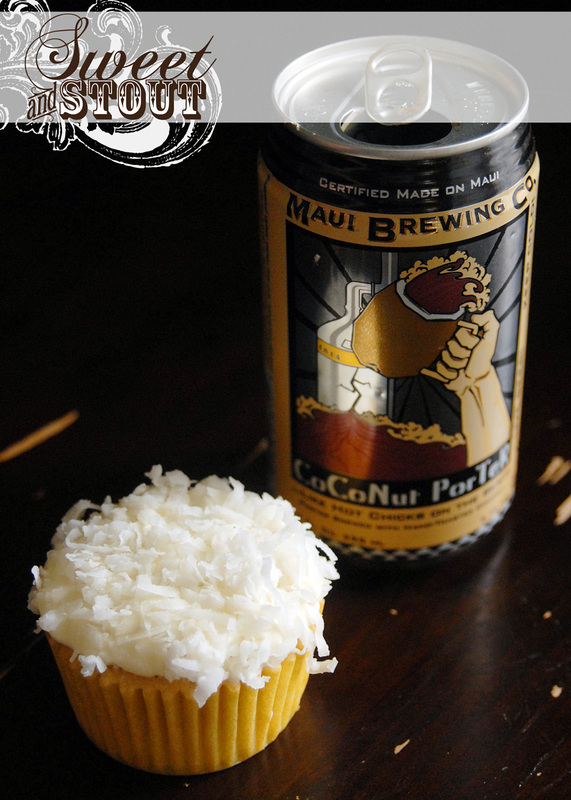 A couple weekends ago we bought a few beers from here, one of them being Maui Brewing Company’s CoCoNut Porter. This beer is delicious! 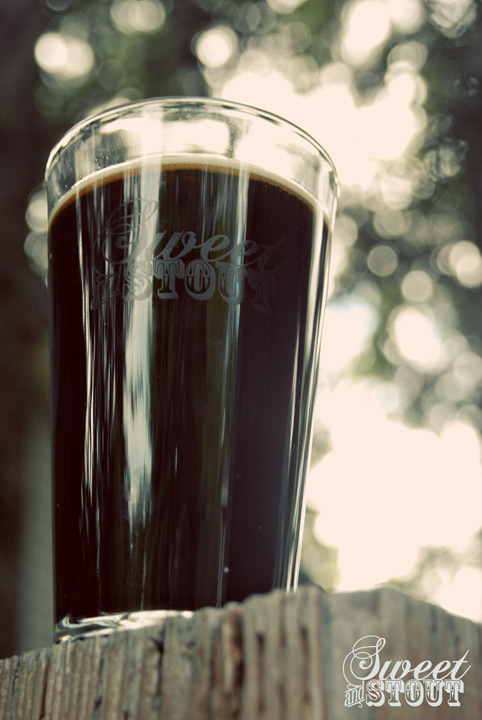 It’s smooth, creamy and highly drinkable. 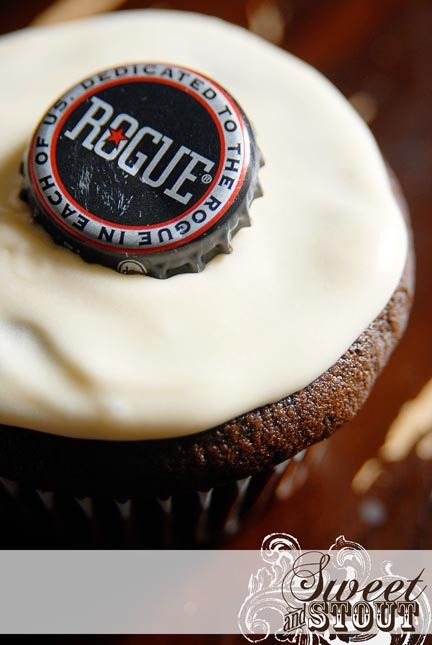 I knew after having that can of beer that I had to come up with a recipe to go along with it. So this past Saturday I found a can of it at Huckleberry’s (for $3, a bit spendy but SO worth it). Just for added fun we ran over to the liquor store and bought a sample sized bottle of Malibu Rum to add to the frosting, a most excellent idea! In the spirit of creativity, I thought it would be really fun if the cupcakes had a jelly filling. 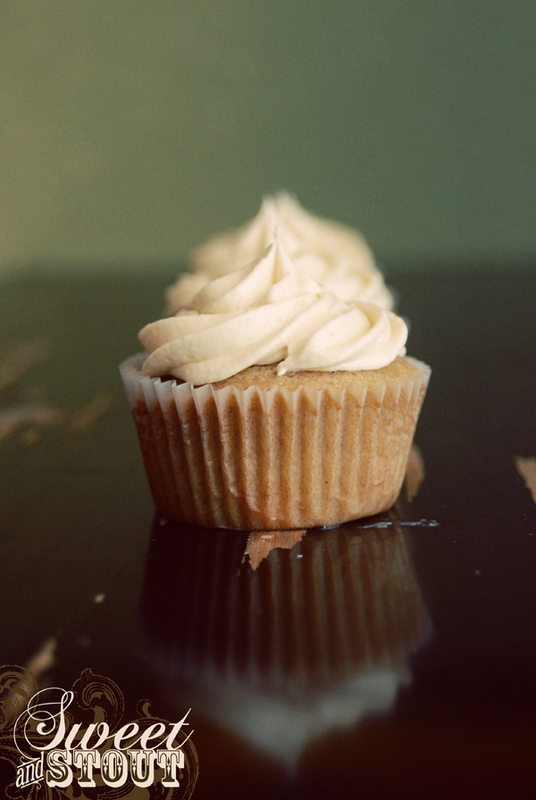 We went to Michael’s and bought a frosting/filling injector to test it out. The filling turned out really tasty, but there were crushed pineapple bits in it and we had trouble getting it to squeeze out of the injector without blowing up the cupcakes. After blowing up a couple cakes we gave up on it and just frosted the cupcakes as usual. This recipe was interesting in that it doesn’t have baking soda or baking powder in it (a rising agent). The original recipe that I found called for lemon-lime pop and I think (and I’ve read) that carbonation used in recipes helps the batter rise. This must be what was going on, as I only used 1/2 cup of beer in the recipe, and they rose up just like any other one. The batter was pretty sweet (in a great, addicitve way) and you could taste the beer in it, which was nice. 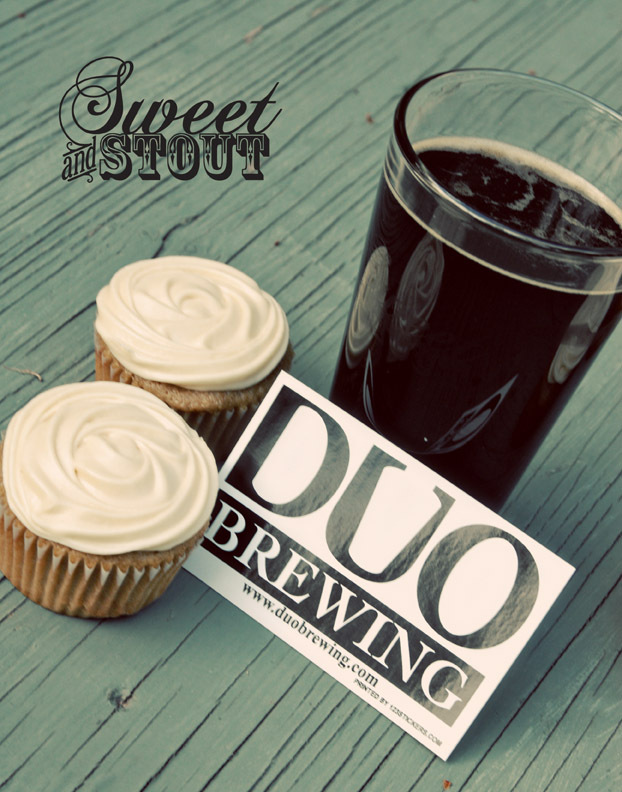 I was a little surprised that the cupcakes didn’t turn out a darker color than they did, this beer is seriously dark. 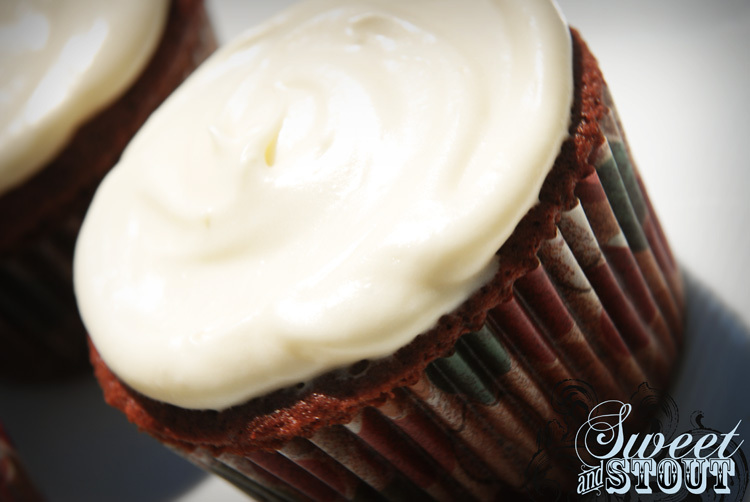 We finished these off with my favorite frosting, cream cheese, with an addition of Malibu rum to get in some extra coconut flavor. 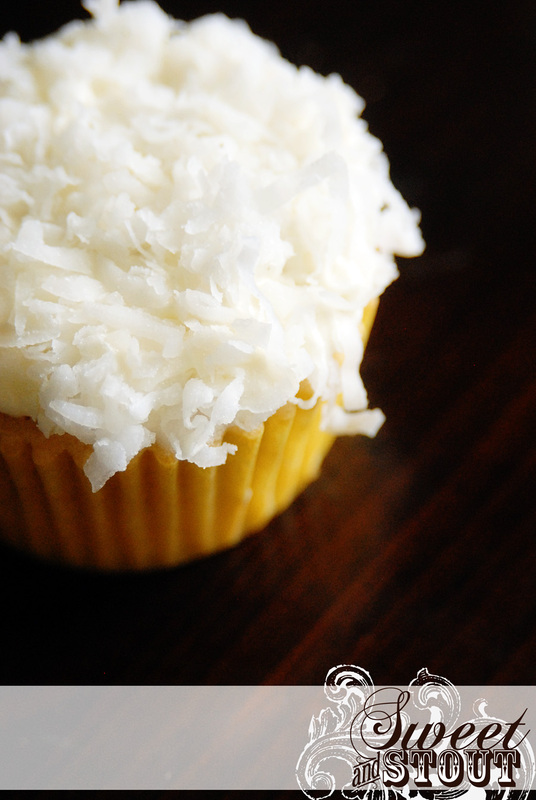 I also had some coconut flake in the pantry, so I dipped half of the finished cupcakes in that. 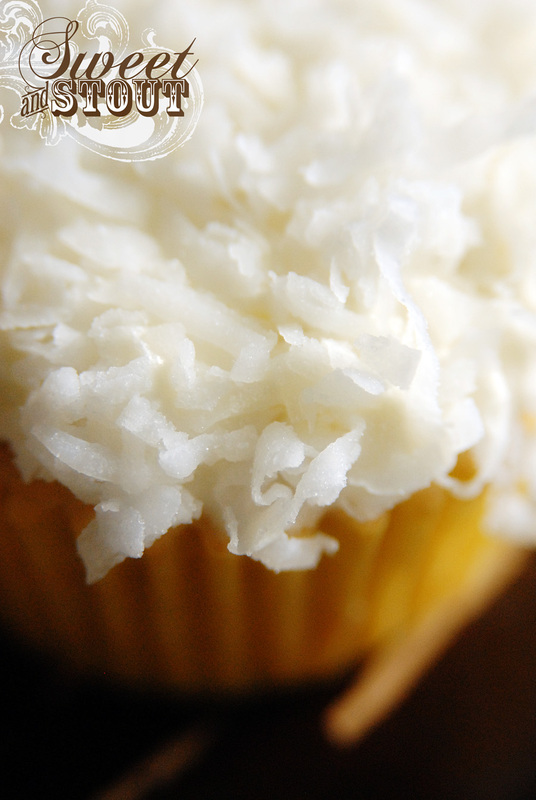 What can I say, I love coconut! 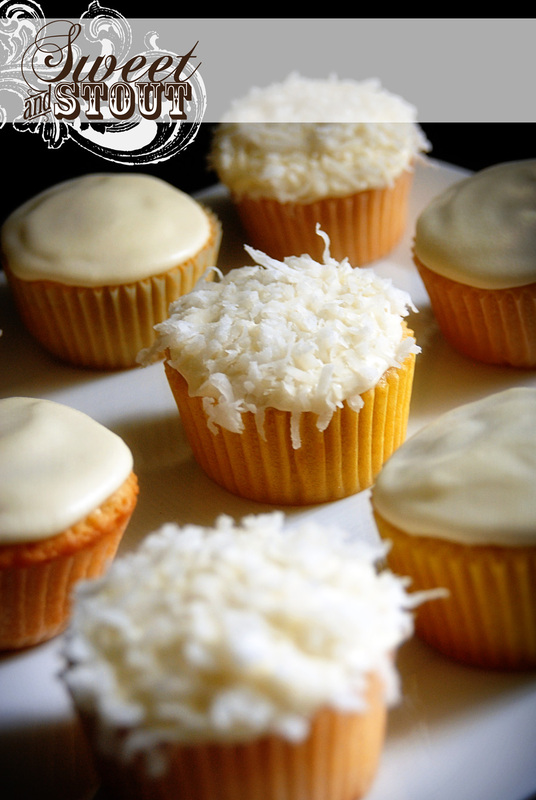 I think the next time I bake these I’ll find a way to make the filling without the pineapple chunks so I can get them in the cupcakes easier. Despite how deformed the ones I injected looked, they tasted sinfully delicious. I won’t be posting pics of the duds, besides, I already ate them, but I hope you enjoy the pictures of the keepers! Next week I’m thinking of doing something a little different, as in, I’m going to post my recipe so you all can give these a try. I mean, I don’t want to give away all my prized secrets just yet, but I think you deserve a recipe to try out! Is that a good idea? Would you want to make them? I don’t really know what kind I will make yet… I suppose if anyone had a request, I’d look into it too!